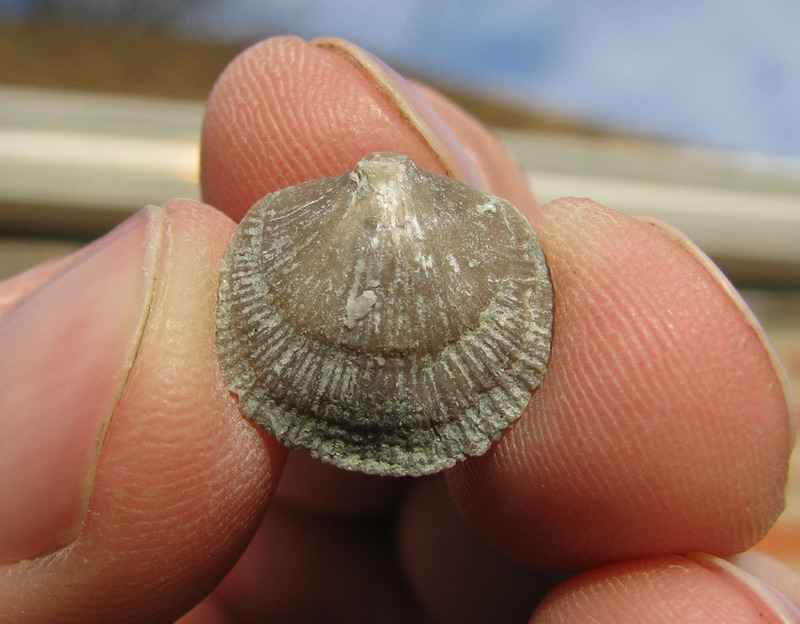 The photo above (copyright Dave), may or may not show Dalmanella, a brachiopod originally described from the later Ordovician of Sweden. Dalmanella belongs to the Orthida, one of the earliest groups of articulate brachiopods to appear in the fossil record ('articulate' meaning that the two valves of the shell are hinged together, not that they are particularly well spoken). 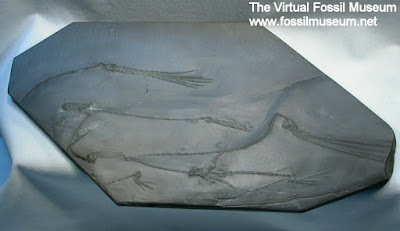 The Dalmanellidae, the family to which Dalmanella belongs, are known from the lower Ordovician to the lower Carboniferous (Williams & Wright 1965). Over the years, numerous fossil brachiopods from Europe and North America have been assigned to Dalmanella, leading Jin & Bergström (2010) to describe it as "perhaps one of the most commonly reported orthide brachiopods". However, if truth be told, the main reason Dalmanella is so widely recognised is because of how perfectly unremarkable it is. It is small and unspecialised, and the genera within Dalmanellidae have mostly been separated by somewhat vague characters such as shell shape and ribbing pattern. Some studies of variation in dalmanellid populations have questioned whether characters used to separate genera can even be used to separate species or whether they may vary within a single population. This uncertainty lead Jin & Bergström (2010) to restudy the original type species of Dalmanella, D. testudinaria. Their conclusion was that D. testudinaria was morphologically distinct from North American species attributed to the genus: for instance, the midline of the dorsal valve bore an interspace (the furrow between two costae) in D. testudinaria but a raised costa in the American species. 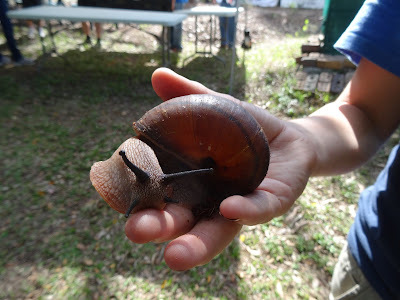 The myophore, a process associated with the hinge to which the muscles responsible for opening the shell would have attached in life, is much narrower in D. testudinaria than in the American species. Not only were the morphologically distinct, they were ecologically distinct as well: D. testudinaria being found in cooler, deeper waters while the American species basked in tropical shallows. Not for the first time, it appears that an external sameyness masks an internal divergence. Jin, J., & J. Bergström. 2010. True Dalmanella and taxonomic implications for some Late Ordovician dalmanellid brachiopods from North America. GFF 132 (1): 13–24. Williams, A., & A. D. Wright. 1965. Orthida. In: Moore, R. C. (ed.) Treatise on Invertebrate Paleontology pt H. Brachiopoda vol. 1 pp. H299–H359. The Geological Society of America, Inc.: Boulder (Colorado), and The University of Kansas Press: Lawrence (Kansas). During my early years in rural New Zealand, I would often take note of the variety of insect life that could be seen coming to the screen doors at night, attracted by the light from inside the house. 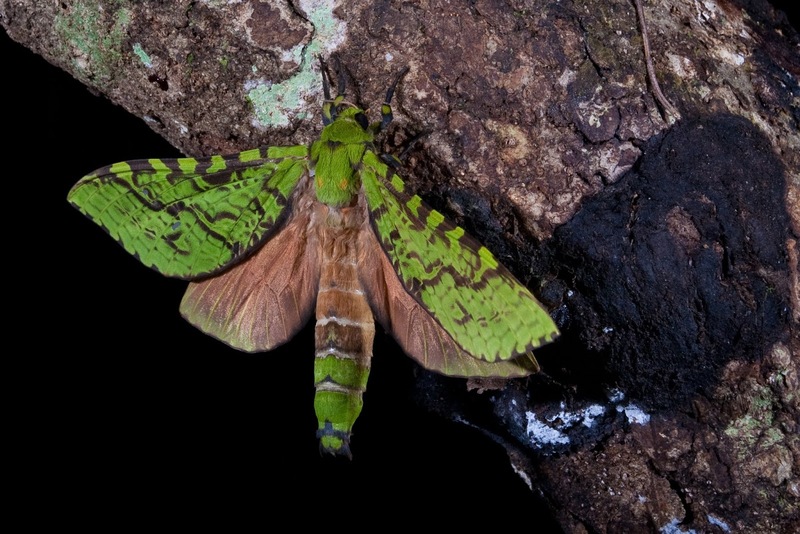 Among the most spectacular animals that would sometimes turn up was a gigantic pale green moth, about three inches long as it crawled across the screen. This was the puriri moth Aenetus virescens, perhaps New Zealand's best known member of the moth clade Exoporia. Puriri moth Aenetus virescens, copyright Nga Manu Images NZ. The Exoporia is one of the more basal moth groups alive today. The name of the clade refers to one of its most distinctive features: a female genital system with separate external openings for the seminal receptacle and the oviduct, meaning that the male's sperm has to travel along an external groove between the two if it is to fertilise the egg (in other Lepidoptera, there is a single cloacal opening, or there are separate openings but the cavities are connected by an internal duct). Other important features of the clade include dicondylic antennae, with two instead of just one articulations between the antenna and the head, and a male reproductive system without a sclerotised tubular intromittent organ (Kristensen 1978; the males instead have the gonopore opening on a shorter protuberance). 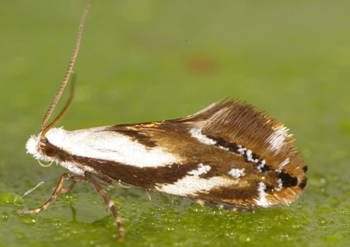 Six families are generally recognised within the clade but the majority of species (including the puriri moth) belong to just one of these families, the Hepialidae, commonly known as the ghost moths. Bentwing ghost moth Zelotypia stacyi, copyright CSIRO. Hepialids definitely buck the phylogenetic trend among moths. Lepidopterists commonly divide the moth and butterfly order between two main groupings, somewhat self-explanatorily referred to as Micro- and Macrolepidoptera. To some extent, this is merely a division of convenience (the practicalities of working with smaller and larger moths can be quite different) but Macrolepidoptera is also used as the name of a major clade within the order with micro-Lepidoptera then indicated for any lepidopteran not belonging to this clade. By this measure, hepialids are by far the largest micro-Lepidoptera out there (most other examples are unquestionably micro). I've already alluded to the fifteen centimetre wingspan of the puriri moth but this isn't even close to being the largest hepialid out there. The honour perhaps goes to the bentwing ghost moth Zelotypia stacyi of eastern Australia which reaches a wingspan of 25 centimetres, a full ten inches. 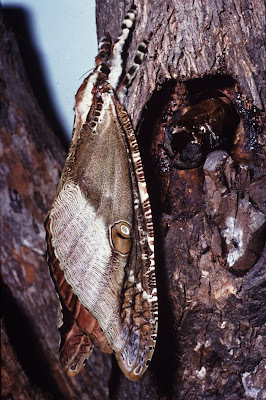 The larvae of hepialids are commonly borers in live trees; the puriri moth, for instance, gets its name because it burrows into puriri trees Vitex lucens. Other species live as larvae in burrows in soil, emerging at night to feed on pasture or leaf litter, or feeding externally on tree roots. Adult hepialids are short-lived and do not feed, and as such their proboscis is reduced or absent. They may emerge en masse at particular times of year. Following mating, females may scatter their eggs at random during flight or lay them in loose masses on the ground, with larvae finding a suitable food source after hatching. Because of the high mortality rates associated with this scatter-shot method, laying rates can be exceedingly large: females of some genera may produce around 18,000 eggs apiece (Nielsen & Common 1991). Mnesarchaea acuta, copyright George Gibbs. 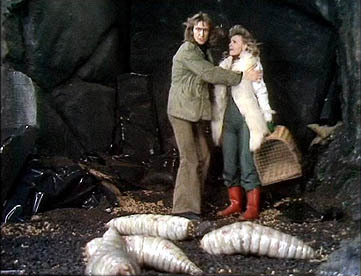 The other exoporian families are all much less diverse and more localised. They are also all small moths, far more typical 'micro-Lepidoptera'. The genus Mnesarchaea, endemic to New Zealand, retains functional mouthparts and is believed to be the sister group to all other exoporians. Larvae of Mnesarchaea live in silken galleries among mosses and liverworts, feeding on moss and liverwort leaves, algae, fungal spores and the like. The remaining families all lack functioning mouthparts as adults but their habits are otherwise all but unknown. Anomoses hylecoetes is placed in its own family known from rainforests in eastern Australia. The family Neotheoridae was until recently known from only a single female specimen collected in Brazil, but a few further species of this family were described recently by Simonsen & Kristensen (2017). Prototheora, another genus held worthy of its own family, is found in southern Africa. Finally, the family Palaeosetidae is known from a small number of genera with disjunct distributions in Colombia, south-east Asia and Australia. Because of its scattered distribution, some authors have questioned whether this last family is monophyletic, but an analysis of exoporian phylogeny by Simonsen & Kristensen (2017) continued to support it as such. It is not impossible that this family is more widespread, its apparent rarity due to the overlooking of small moths emerging for only very short periods, living just long enough to breed and deposit their eggs in as-yet-unknown locales. Kristensen, N. P. 1978. A new familia of Hepialoidea from South America, with remarks on the phylogeny of the subordo Exoporia (Lepidoptera). Entomologica Germanica 4 (3–4): 272–294. Nielsen, E. S., & I. F. B. Common. 1991. Lepidoptera (moths and butterflies). In: CSIRO. The Insects of Australia: A textbook for students and research workers 2nd ed. vol. 2 pp. 817–915. Melbourne University Press: Carlton (Victoria). Simonsen, T. J., & N. P. Kristensen. 2017. Revision of the endemic Brazilian 'neotheorid' hepialids, with morphological evidence for the phylogenetic relationships of the basal lineages of Hepialidae (Lepidoptera: Hepialoidea). Arthropod Systematics and Phylogeny 75 (2): 281–301. A couple of years ago, I presented a post about the Lepismatidae, the family including the familiar household silverfishes. In that post, I made an offhand reference to other, less well known families of the wingless insect order Zygentoma. The time has come to look at those families. 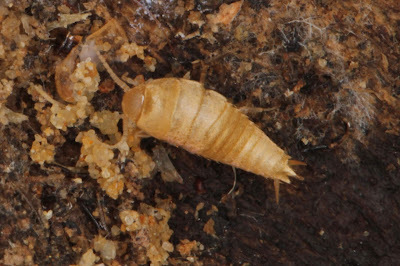 Squamatinia algharbica, a subterranean nicoletiid from Portugal, copyright S. Reboleira. The Zygentoma are divided between five or six living families, depending on how you count them. The largest of these other than the Lepismatidae is the Nicoletiidae, representatives of which may be found in most parts of the world if you know where to look. And therein lies the rub: the eyeless nicoletiids are usually to be found in subterranean habitats, burrowed into soil or within caves. They are pale in coloration, usually white or golden. Nicoletiids have less flattened bodies than lepismatids and often lack the covering of scales found in the latter. One subfamily of nicoletiids, the Atelurinae, is sometimes treated as a separate family (hence the uncertainty above): not only do they have the covering of scales most other nicoletiids lack, they are generally less elongate and are oval or teardrop-shaped in form. Atelurines are inquilines of social insects, making their living in the nests of ants or termites. While some observations have been made of atelurines taking food directly from their hosts, it seems that they mostly live as scavengers on items dropped within the nest. They avoid capture and/or eviction by their hosts through their slipperiness and speed (Smith 2017). 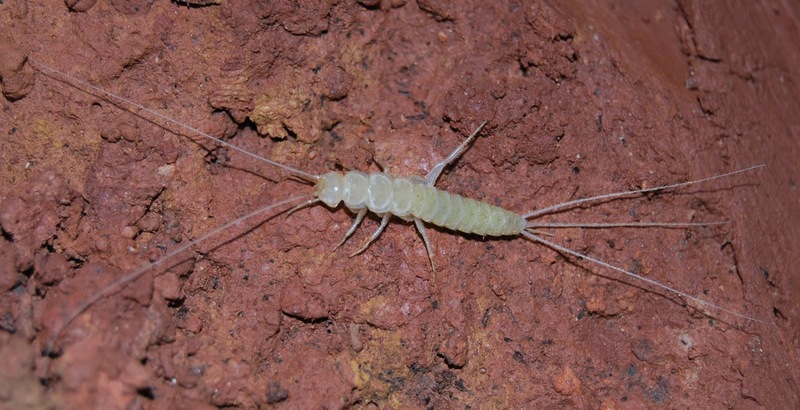 An atelurine silverfish from Tasmania, copyright Zosterops. The other three families are more localised in their distributions. The Protrinemuridae are found in scattered, disjunct locations including the Middle East, eastern Asia and Chile. They are similar in appearance to the Nicoletiidae, being eyeless, scaleless and subcylindrical, and were classified with that family until fairly recently. Differences between the Nicoletiidae and Protrinemuridae include the nature of the cuticular plates making up the underside of the abdomen. 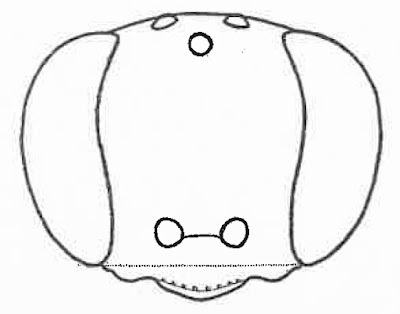 In nicoletiids, these are divided between median sternites and lateral coxites; in protrinemurids, a single undivided plate covers the underside of each abdominal segment. 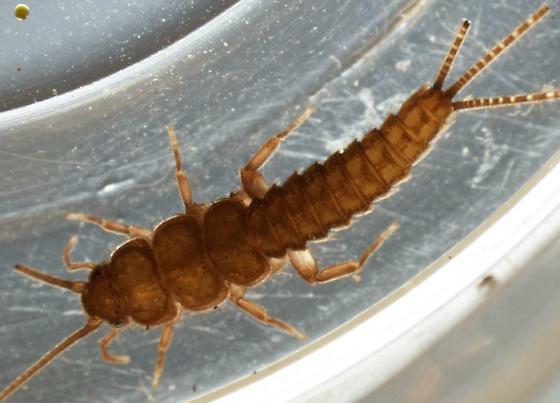 Maindronia is a genus of silverfish placed in its own family that resembles Lepismatidae in possessing eyes and a covering of scales. This genus also has a disjunct distribution, being known from Egypt, Saudi Arabia, Afghanistan and Chile. Tricholepidion gertschi, copyright Samuel DeGrey. The fifth family of Zygentoma includes a single living species Tricholepidion gertschi known from the coastal region of northern California, where it is found under decaying tree bark. Tricholepidion retains a number of plesiomorphic features for Zygentoma and is universally accepted as the most divergent member of the order: it lacks scales, it possesses ocelli as well as the compound eyes, it has five rather than four or fewer segments in the tarsi, and it possesses a greater number of ventral styli on the abdomen. Tricholepidion is also hypognathous (that is, it has the head oriented so that its mouth is directed downwards) whereas other Zygentoma are generally prognathous, with the mouthparts directed forwards (Engel 2006). Tricholepidion has usually been included in the Lepidotrichidae, a family originally described for a fossil species Lepidothrix pilifera from the Eocene Baltic amber, but Engel (2006) argued that Lepidothrix was in some ways more derived than Tricholepidion (specifically, it lacks ocelli) and that Tricholepidion should be placed in its own family. Indeed, Tricholepidion is divergent enough that some have even suggested it be excluded from the Zygentoma and regarded as the sister taxon to the broader clade uniting silverfish with the winged insects. This is certainly a minority view, however: most authors continue to regard it as a true, albeit highly unusual, zygentoman. 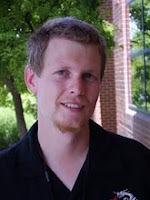 Engel, M. S. 2006. A note on the relic silverfish Tricholepidion gertschi (Zygentoma). Transactions of the Kansas Academy of Science 109 (3–4): 236–238. Smith, G. B. 2017. 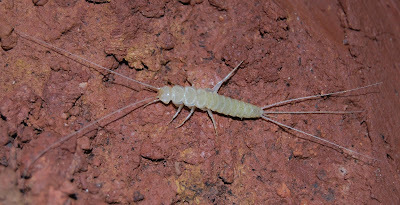 The Australian silverfish fauna (order Zygentoma)—abundant, diverse, ancient and largely ignored. Gen. Appl. Ent. 45: 9–58. 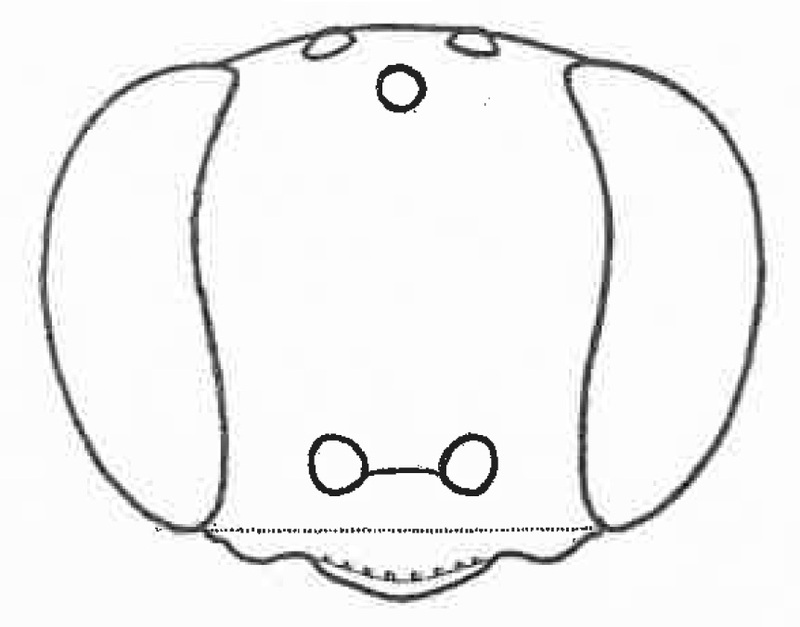 Face of Miscophus littoreus, from Andrade (1960). For this post's semi-random subject, I drew the crabronid wasp species Miscophus littoreus. 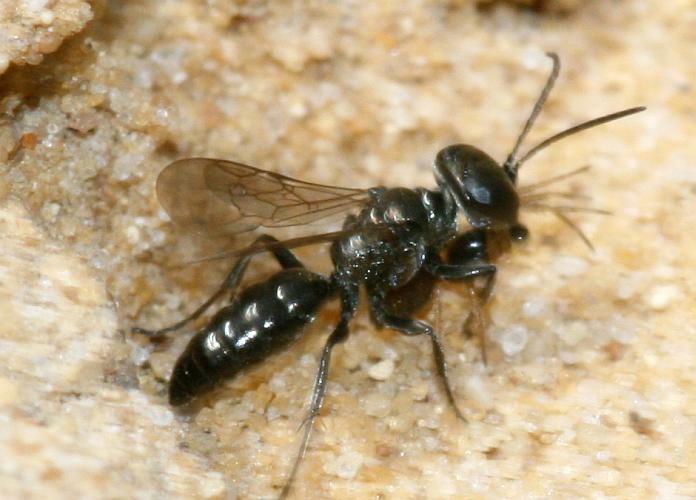 This small, mostly black wasp (about five millimetres in length) was described from Morocco by Nuno Freire de Andrade in 1960, with the original description seeming to still be the only source for information about it. Miscophus is a cosmopolitan genus, found on all continents except Australia and Antarctica (though its presence in South America seems marginal). They are characterised by wings with the outer veins reduced or lost so they have at most two submarginal and two discoidal cells, with the second submarginal cell (if present) triangular and petiolate, and mid-coxae that are very closely placed or touching each other along the midline. Miscophus littoreus is one of a group of closely related species within this genus found between north Africa and central Asia with the fuller complement of wing cells, and the features distinguishing it from other species in this group are rather fine: a slightly longer clypeus, a shinier and less punctate mesosoma. The wings are darker shaded towards the ends, and females have a tarsal comb (a series of longer spines along the front edge of the fore tarsus). Another species of Miscophus, M. ater, from here. There don't seem to have been any natural history observations made for M. littoreus itself but we can infer that it is probably similar in behaviour to other species of Miscophus. North American Miscophus species dig nests as short burrows in sandy soil, only a few centimetres in length (Bohart & Menke 1976); this is why the females have the tarsal comb. Nests have at most only a few cells each, often only one. The cells are stocked with small spiders, often juveniles (though I suspect the preference for juvenile spiders has more to do with size preference than anything else. The tendency in many Miscophus species to show a reduction in the wing venation is related to a broader tendency in the genus to not be enthusiastic fliers. Most Miscophus females run along the ground rather than fly when hunting prey, and they do the same when carrying prey back to the nest. At most, they may make only short hopping flights. Miscophus individuals on the ground may be mistaken for ants, which they often hang around while foraging, hoping to avoid attention while they search for unsuspecting spiders. Andrade, N. F. de. 1960. Palaearctic Miscophus: bicolor group and isolated species (Hymenoptera, Sphecidae). Memórias e Estudos do Museu Zoológico da Universidade de Coimbra 262: 3–136. Bohart, R. M., & A. S. Menke. 1976. Sphecid Wasps of the World. University of California Press: Berkeley. I've complained in the past about the decided lack of imagination displayed by many British naturalists when describing the fauna of Australasia. So many animals got lumbered with the names of European species to which they bore a superficial resemblance but of which they were not necessarily close relatives. So we got warblers that are not warblers, cod that are not cod, and the subject of today's post: robins that are not robins. Male scarlet robin Petroica boodang, copyright Patrick Kavanagh. Petroica is a genus of small perching birds found widely in Australasia, including species on various islands of the south Pacific. They are dumpy little birds whose males often have contrasting colour patterns with a dark dorsum and a light underside, though a couple of species are uniformly black. A number of species have red patches on the forehead and/or breast, and it is not too difficult to see why British naturalists chose to compare them to the European robin. They are insectivores, gleaning prey from vegetation or on the ground. Over a dozen species are recognised in the genus Petroica, though the exact number varies depending on the author. Phylogenetic studies indicate four main lineages within the genus (Kearns et al. 2018) with some correlation between phylogeny and distribution. 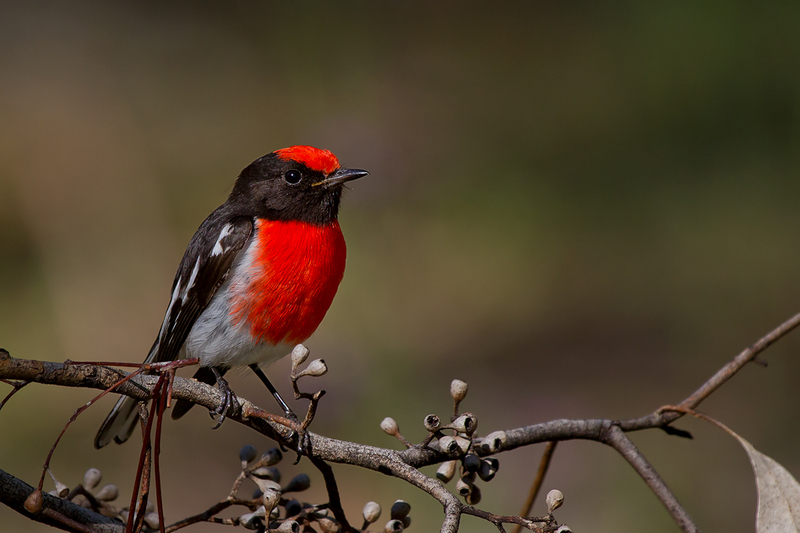 An Australian clade includes the scarlet robin P. boodang, the flame robin P. phoenicea, the pink robin P. rodinogaster and the rose robin P. rosea. 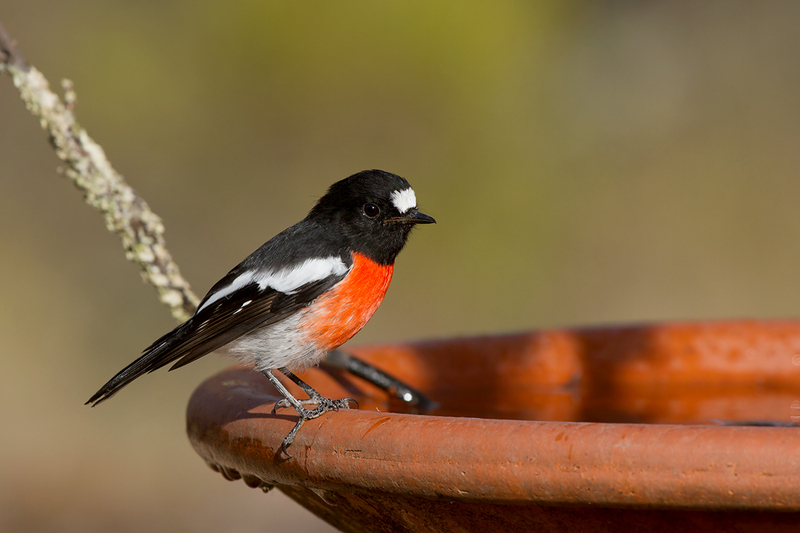 As is indicated by their names, these are all red- or pink-chested forms, and they are found in woodlands in southeastern and southwestern Australia where they usually feed from leaves and branches. Females are duller in coloration, mottled grey or brown above and having the red on the underside lessened or lost; for the most part, the same pattern applies to females of the species described below. Red-capped robin Petroica goodenovii, copyright Patrick Kavanagh. 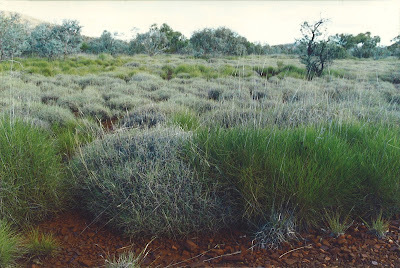 More arid parts of Australia are inhabited by the red-capped robin Petroica goodenovii which is more terrestrial in habits than the preceding species. 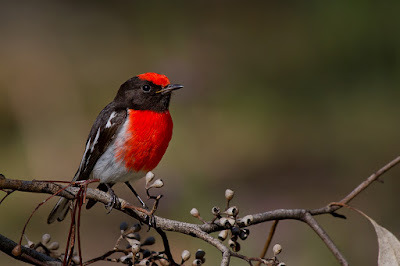 The red-capped robin forms a clade with two insular species, the Norfolk Island robin P. multicolor and the Pacific robin P. pusilla, the latter being found over a wide range from the Solomon Islands to Samoa (with a subfossil record from Tonga). The Norfolk Island robin is endangered with only an estimated 400 to 500 pairs surviving, a position whose severity was not fully appreciated until recently owing to the Norfolk Island and Pacific robins previously being regarded as conspecific with the Australian scarlet robin (Kearns et al. 2016). Kearns et al. (2016, 2018) also identified a strong genetic divergence between Pacific robins from the Solomon Islands and the eastern part of their range, suggesting the possibility of a further species division. However, they did not support such a divergence for the Samoan population which had previously been suggested as a candidate species by plumage and song characters. Snow mountain robin Petroica archboldi, copyright Papua Expeditions. The third clade includes two montane New Guinean species, the subalpine robin Petroica bivittata and the snow mountain robin P. archboldi. 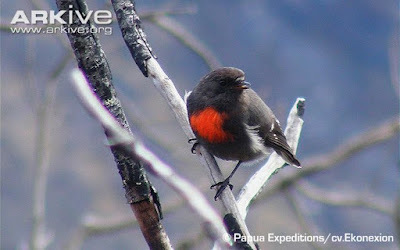 The male subalpine robin has a black back and white breast, without any red patches, and the species is found in high mountain forests and shrublands. The snow mountain robin, on the other hand, is a large Petroica species that is mostly slate-grey in coloration with a small red patch on the upper breast. It is found at the highest altitude of any bird in New Guinea and is the only bird found there in rocky scree habitats above the tree line. Both the New Guinean Petroica species, but particularly P. archboldi, have disjointed, localised ranges, and Kearns et al. (2018) expressed concern about the snow mountain robin's likelihood of future survival in the face of mining pressures and temperature rises. North Island robin Petroica longipes, copyright Tony Wills. 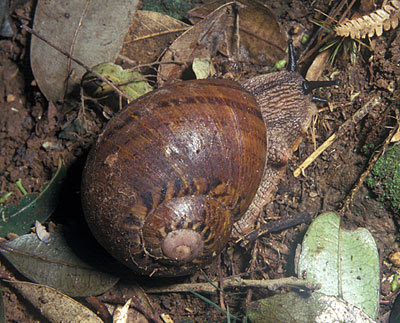 The fourth and final clade, albeit a weakly supported one, unites the New Zealand Petroica species. Historically, most authors have recognised three Petroica species in New Zealand that, with the typical pithiness often associated with discussions of the somewhat depauperate New Zealand fauna, were generally known simply as the robin P. australis, the black robin P. traversi, and the tomtit P. macrocephala. However, multiple subspecies have been recognised within both the robin and the tomtit and recent years have seen calls for all to be recognised as distinct species (potentially raising the number of species in New Zealand to nine). Acceptance of these proposals has been varied: the North Island robin P. longipes now seems to be generally accepted as a separate species from the South Island P. australis but I have seen less recognition of more than one species of tomtit. The New Zealand robins are largely terrestrial feeders, and are noticeably longer-legged than other Petroica species. Male New Zealand robins are also duller in coloration with brownish backs. The more arboreal tomtits are the more similar in overall appearance to Petroica species from elsewhere. Most tomtit males are black above and white or yellow below. For the most part, female tomtits resemble other Petroica species in being duller than the males, brown above rather than black, but the female Auckland Island tomtit P. (macrocephala) marrineri is closer in appearance to the male. The Snares Island tomtit P. (macrocephala) dannefaerdi is uniformly black in both sexes. In this it resembles the larger black robin of the Chatham Islands, some distance east of New Zealand's South Island. Black robins are most reknowned for their conservation history with introduced predators reducing the entire species' population to only five individuals in 1980, including only a single breeding female. An intensive management program was instituted beginning with the capture and transfer of the entire population to a predator-free island. Higher breeding rates were encouraged through the removal of egg clutches from robin nests, with the bereaved birds laying a new batch to replace them and the original clutch placed in a nest of the local tomtit race to be raised cuckoo-style. As a result of this effort, population numbers increased until the current black robin population numbers about 250 individuals. Obviously, that's by no means enough to count their survival assured (and questions still linger about what, if anything, will be the long-term effects of inbreeding from such a minute founding populations) but it's still one heck of a lot better than what it was. Kearns, A. M., L. Joseph, L. C. White, J. J. Austin, C. Baker, A. C. Driskell, J. F. Malloy & K. E. Omland. 2016. 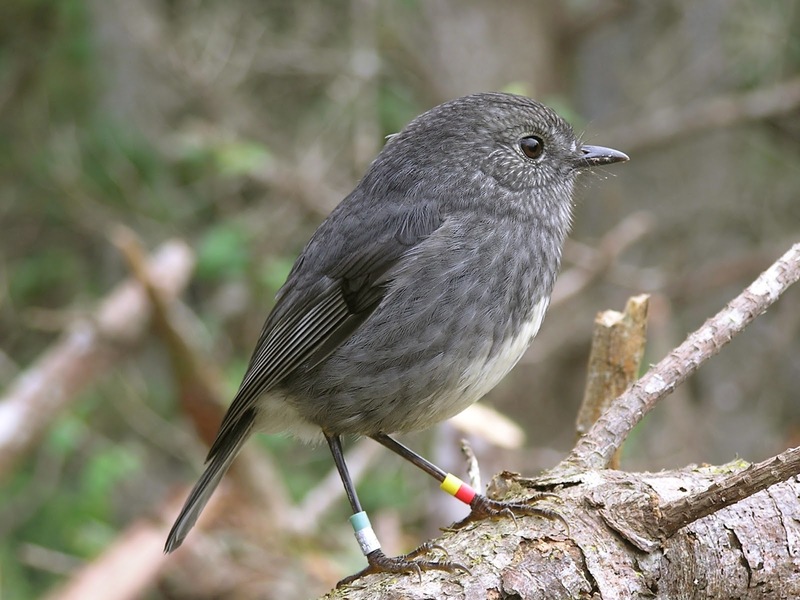 Norfolk Island robins are a distinct endangered species: ancient DNA unlocks surprising relationships and phenotypic discordance within the Australo-Pacific robins. Conserv. Genet. 17: 321–335. Kearns, A. M., L. Joseph, A. Thierry, J. F. Malloy, M. N. Cortes-Rodriguez & K. E. Omland (in press 2018) Diversification of Petroica robins across the Australo-Pacific region: first insights into the phylogenetic affinities of New Guinea's highland robin species. Emu. One question that I haven't yet found an answer to is why the Palaeozoic marine fauna seems to have included so many filter feeders. Cystoids, blastoids, graptoloids... so many of the distinctive taxa occupying this niche would be gone by the period's end, without leaving any clear analogues behind them. What was the cause underlying this abundance? Is it simply a misapprehension caused by the filtering effect of history, with the modern fauna containing fewer major lineages but no fewer actual species? Is it the distorting lens that causes us to tend to assign a higher 'rank' to those lineages arising earlier in time, whatever their practical levels of disparacy? Or was there actually something different about what could be found in Palaeozoic seawater? Reconstructions of short-armed and long-armed species of Pisocrinus, from Rozhnov (2007). The Pisocrinidae are one of those distinctive Palaeozoic marine groups, known from around the world during the Silurian and Devonian. As crinoids, they were perhaps not as immediately unfamiliar to the modern eye as some of the other taxa that could be found at that time, but they were certainly different from any modern crinoid. The majority of the crinoids that have ever lived can be assigned to one of two main clades. One, the cladid lineage, includes all the crinoids alive today. 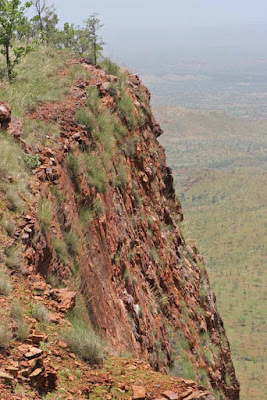 Pisocrinids belong to the other major lineage, the disparids, which were prominent for most of the Palaeozoic era but failed to make it past the end of the Permian. Disparids differed from cladids in that their calyx included a single circlet of plates (the inferradials) beneath the circlet of the radials (the large plates making up the main body of the calyx) whereas cladids (at least to begin with) had two such circlets. Many disparid sublineages showed a tendency towards reduction and/or simplification of the calyx. In pisocrinids, most of the calyx was made up of just three plates: two large radials (representing the A and D rays of the basic crinoid calyx) and a greatly enlarged B inferradial. The B, C and E radials were all reduced in size. The arms of pisocrinids mostly lacked lateral pinnules and were undivided; one genus, Cicerocrinus, had bifurcating arms bearing lateral ramules (Moore et al. 1978). The length of the arms varied considerably between species: in some they were quite short and broad, in others they were remarkably long. Because their derived morphology made it difficult to compare pisocrinids to related families, their origins have been regarded as mysterious. 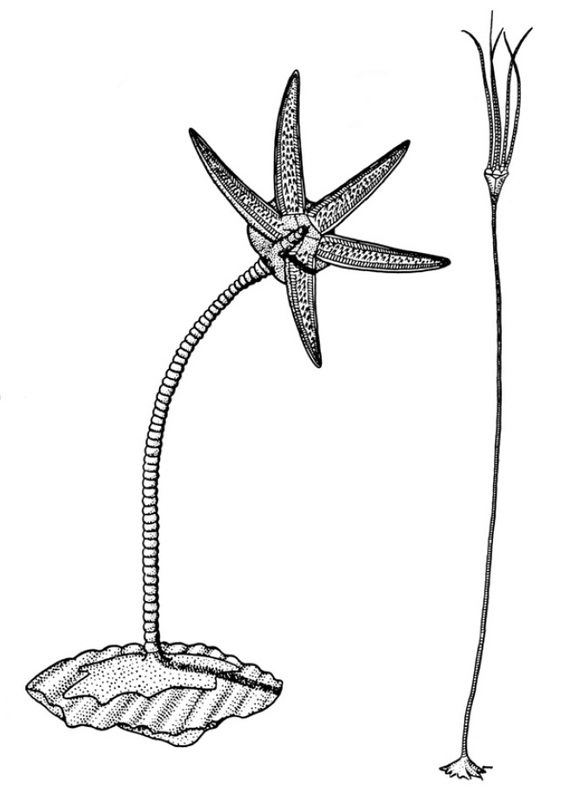 Rozhnov (2007) suggested a derivation from an earlier, more typical crinoid family, the Homocrinidae, via paedomorphosis, possibly as a result of the evolution of a longer larval period in the life cycle (he specifically suggested that this extended larval phase may have allowed the ancestors of pisocrinids to spread across the Iapetus Ocean between the then-existing continents of Laurentia and Baltica). A direct pisocrinid-homocrinid connection was not supported in the phylogenetic analysis of disparids by Ausich (2018) but Rozhnov's overall model of pisocrinid paedomorphosis remains a possibility. Assemblage of Triacrinus, from here. During the Silurian, pisocrinids were among the most abundant, if not the most abundant, groups of crinoids. They were found in a variety of habitats but were particularly abundant around reefs in deeper waters. At first glance, the non-pinnulate arms of pisocrinids appear poorly suited for filter feeding, and one might be inclined to propose a more tentacular method of obtaining food items. However, such a method would seem unlikely for the short-armed species, whose arms would have been almost entirely inflexible. Even the long-armed species sometimes had arms made up of relatively long segments whose flexibility may have been limited. An alternative possibility, I suppose, is that in life pisocrinids may have had long tube feet that took the place of the missing pinnules. Meanwhile, the absence of the pinnules meant that the arms could be lain tightly alongside each other when the crown was closed. Earlier authors presumed that, because of their preference for deeper waters, pisocrinids were rheophobic (that is, they were found in places where the water lacked a noticeable current). However, Ausich (1977) proposed that they were low-energy rheophilic, seeking locations where a moderate but steady current prevailed. The current would provide a steady supply of organic particles that could be captured by the crown, and the ability to close the arms tight would protect the oral region during occasional bouts of rougher conditions. Ausich, W. I. 1977. The functional morphology and evolution of Pisocrinus (Crinoidea: Silurian). Journal of Paleontology 51 (4): 672–686. Ausich, W. I. (in press, 2018) Morphological paradox of disparid crinoids (Echinodermata): phylogenetic analysis of a Paleozoic clade. Swiss Journal of Palaeontology. Moore, R. C., N. G. Lane, H. L. Strimple, J. Sprinkle & R. O. Fay. 1978. Inadunata. In: Moore, R. C., & C. Teichert (eds) Treatise on Invertebrate Paleontology pt T. Echinodermata 2. Crinoidea vol. 2 pp. T520–T759. The Geological Society of America, Inc.: Boulder (Colorado), and The University of Kansas: Lawrence (Kansas). Rozhnov, S. V. 2007. Changes in the Early Palaeozoic geography as a possible factor of echinoderm higher taxa formation: delayed larval development to cross the Iapetus Ocean. Palaeogeography, Palaeoclimatology, Palaeoecology 245: 306–316.